Markus Martinovitch, Markus crying M&Ms candies in dry grass, 2018. Acrylic on canvas, 100 x 100 cm / 39.37 x 39.37 in. LONDON.- Gazelli Art House is presenting Silver Lining, a group show of works by Pauline Boty, Niyaz Najafov and Markus Martinovitch exploring the artists diverse cultural backgrounds and the worlds they occupy. The exhibition examines their different generations, social and economic environments, personal stories and unique influences behind their works. Covering three different epochs and ages, these artists highlight the role of art in their lives from sociopolitical tools to forms of therapy and shared struggles towards meaning. Niyaz Najafov, a former soldier in the Azerbaijan army, channels his existential anguish into art. Najafov believes he was born an artist and his life has been about making sense of the world around him through the eyes of an artist. 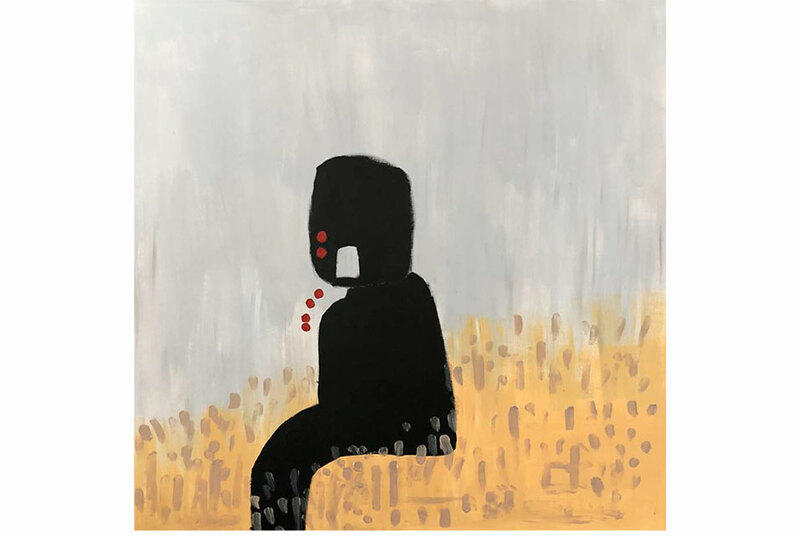 As a self-taught painter, Najafov creates magnetic and often tortured figures presenting imaginary characters that disturb and tickle in equal measure. He records everyday scenes with a profound intensity, capturing his struggle with reconciling the distressing and humorous parts to the human condition. Compared to Francis Bacon by the Huffington Post, his art has been described as raw, crude and sophisticated at the same time and Najafov leads the new generation of Azeri artists who have sprung up following the collapse of the Soviet Union. Markus Martinovitch is a twelve-year-old Russian-German boy with autism who produces extraordinary works. His condition requires heavy medication causing severe side effects such as tremors. He is often unable to paint and suffers prolonged episodes of hallucination. These harmful experiences are transformed through his art to bright and bold exclamations about life itself. During one on his hallucinations, he emerged with a series of works presenting the notion that the world itself might just be an illusion. In his own words, colour does not exist  it is just a reflexion of the light. Despite his young age, Martinovitch brings a remarkably mature and considered approach to his works and is unafraid to tackle complex themes regarding inner and outer spaces and the often-strange relationship between existence and meaning. Silver Lining is about the enduring way art transforms both the lives of the artists and the viewers themselves and portrays the alchemy of creativity, creative energy and art itself, said Mila Askarova, founder of Gazelli Art House.